Goldegg is a town in the Pongau region of Salzburg. It is situated in the Salzachtal, the main valley of the province, at the western-most (and thus most upstream) part of the Pongau. Goldegg is known for its local castle. Even though skiing tourism is less significant in Goldegg than in many other parts of the region, tourism is still an important aspect of the local economy. There is a small (5 hectares) lake in Goldegg. As regards skiing, the community has four drag lifts and some 10 kilometres of slopes. Whilst this might seem little by Pongau standards, the so-called Goldegger Buchberg is part of a bigger association, the Salzburger Sportwelt. This in turn seeded the foundation of the Ski Amade skiing region, one of the biggest skiing areas of Salzburg. This means that holders of local tickets are also entitled to use any other ski lift within the Ski Amade association. In terms of sightseeing, Goldegg has a nice village centre with a few noteworthy houses. There is the obligatory parish church (14th century in this case); and the "Drei Buchen", three very large trees that serve as a memorial. By far the most interesting feature about Goldegg is the castle. During the Middle Ages, Goldegg was the residential town of an influential noble family. Due to the important strategic location in the main valley of Salzburg and all the mining that was going on the the Alpine parts of Salzburg, Goldegg could secure itself a key-position as a local power centre. The current castle was completed in 1339 and is based on the foundations of older castles. In the 15th century, after Goldegg has climbed a regional power peak, turmoil breaks out in the area: Social riots among miners, epidemics, economic decay and finally religious wars following the reformation lead to a change in leadership in Goldegg. 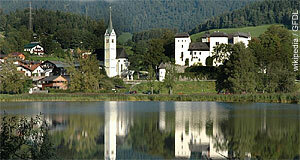 The castle is of key-interest to the Prince Archbishop, Tyrol and Bavaria. When Radstadt supported the Prince Archbishop in the religious peasant wars in the early 16th century (Goldegg did not), the town is finally submerged to Radstadt. As a reward for its loyalty, Radstadt is endowed with several privileges and gets city walls. On contrast, Goldegg loses much of its military significance, the castle changes landlords and is altered into a residential one which led to the addition of a new wing and new interiors. In 1612, the last landlord of Goldegg dies impoverished without a heir. Prince Archbishop Wolf Dietrich, the great reformer of Salzburg, takes Goldegg back and transfers all armour, weapons and other items of strategic importance to the modernised Fortress Hohenwerfen. The castle is already in bad shape and is finally given up. In 1820, after Salzburg has become part of Habsburg Austria, the interiors are taken to the Museum Carolino Augusteum (now Salzburg Museum); the castle itself becomes home to the local court of justice. Today, Goldegg castle belongs to the federal province.